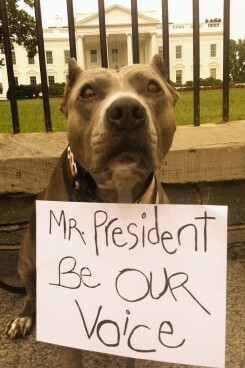 The pinnacle of this function might be to speak to President Obama about the plight of pibbles. If you live in the DC area and are a fan of pit bulls, make a note in your calendar: a march on Washington is being planned for May of 2014. 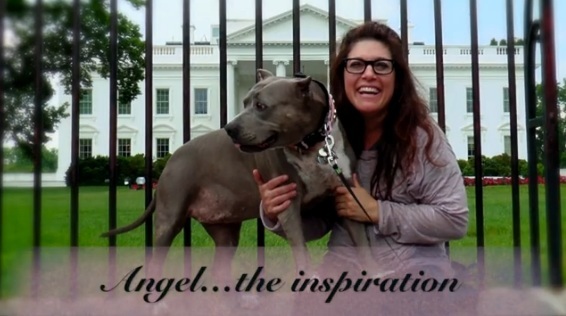 Actress, comedienne and avid pit bull lover Rebecca Corry got the idea after spending some time in Washington, DC with her pit bull, Angel. 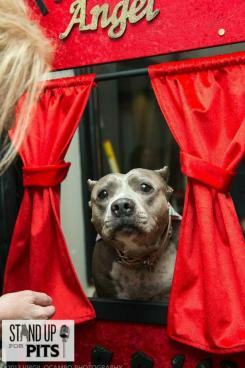 The rescue dog spends some of her time in a canine kissing booth, and is quite popular with fans. Corry noticed how excited fans were after seeing their photo together in the nation’s capital, and thought it might be a good idea to plan a large event the next time she was in Washington. She would be there for her “Stand Up for Pits” comedy show and animal rescue fundraiser in May of next year. The purpose of her proposed One Million Pibble March is to bring awareness to pit bulls. There are so many horror stories heard each day that the sweet, happy-go-lucky pit bulls are branded vicious killers, despite their having clean records and no signs of (unwarranted) aggression. Education would be provided about breed specific legislation, and about the many pit bulls left at high-kill shelters who desperately need homes. Corry aims to have federal funding be used for animal law enforcement and anti-cruelty programs. These issues are personal to Corry; her Angel was badly abused before she was adopted into a loving home. “She was literally tortured for five years of her life,” Corry said of her dog, whose body is riddled with scars and acid burns. She has damaged knees and her ears have been shorn, likely with scissors. Sounds fantastic! Make sure that since you are in a city of big legislative influence, you have a developed plan to propose for making safer communities and enforcing animal laws. I’d check out Animal Farm Foundation’s goals for promoting responsible dog ownership. Agreed 100%. Not only are we advocating to educate the public and correct the false myths about this breed; equally important are safer communities. Animal abuse, dog fighting, torture are not only inhumane, they are learned behaviors that pre-indicate domestic violence, lack of compassion, even serial murder. These things are all tied together, and revealing the truth in all these matters will help make our communities safer and ultimately the world a better place. I am speaking as one who is helping organize and produce this event and proud owner of a pit bull type dog who is an asset, not a threat to the people around her and in her community. EXCELLENT IDEA GOD BLE-S-S YOU AND ALL WHO TRY TO BE A VOICE FOR PITBULLS I PRAY YOU S-U-C-E-E-D IN JESUS NM AMEN AND AMEN!!! From what I’ve learned recently we not only need to stand against BSL but we need to make it so that insurance companies aren’t allowed to have breed restrictions either. Many Pit Bulls and other bully breeds are surrendered and die shelters because insurance companies don’t cover Pit Bulls, won’t cover someone who owns a Pit Bull, or they charge way too much for owners of Pit Bulls. We need to fix all aspects of the problem. I agree with you 100%!! My friend had to surrender his pit over to a rescue because a neighbors dog wandered onto HIS 3 acre property and the dogs fought, the pit did not kill the other dog but the neighbor called animal control and they “deemed” the pit dangerous. BS! He either had to get rid of the dog of show proof of insurance that was astrynomical! He still hasn’t gotten over the loss of Dude. I have fought for the dogs and all pets in the DC / Baltimore area for many years, going back to the breed wars more than a decade ago, when Mary Tyler Moore and Bernadette Peters were our celebrity voices. I be glad to help with this effort but also encourage you to reach out to The Maryland Dog Federation. No one knows this fight better and they are headquartered in the DC area. And how will you defend all the people and animals that are killed or maimed by these horrible dogs? The dogs do not maim and kill. They are what their owners make them. You have a dog that maims and kills it is because that is what the owner has taught them to do. One thing about pit bull terriers they are so anxious to please their owner they will literally do things they would never do without the owner. My brother raised one to be super aggressive. The dog killed other dogs and cats and attacked two people, fortunately not injuring them badly but he was given the option of getting rid of him or having him destroyed. He came to live with us, our yorkie, our german shepherd and our golden retriever and our four cats. He was easy to retrain and he never hurt one of the animals and never attacked another person. Even when we were robbed, all he did was tree the burglar on the kitchen counter until we got home 3 hours later and called the cops. He could have easily attacked him but all he did was sit on the kitchen floor and not move. We had made clear to him that he would not bite or attack. That was in 1980. Since then we have adopted 3 abused pit bull terriers that were aggressive. In all cases as soon as the dog know what was wanted and that aggression was not allowed there was no aggression. They are fantastic dogs loving, incredibly gently and once they realize fighting is not allowed they won’t even let their people raise their voices at each other, they will insert themselves between the people to stop any perceived fighting. Michael Vicks dogs have been adopted with no problem after retraining. It is the owner, not the dog. You want to know what sort of person you are dealing with, look at their dog. Ohhh my God! Why don´t you raise Money to those WHO suffer from thise dogs attack instead! The dogs don’t attack they are doing what humans have trained them to do. The dog is the surrogate of the person.